When I was a kid, one of my favorite activities was to sit in front of my cassette player with my brother or possibly a few cousins or friends and record a “show.” Our little talk show would include plenty of banter, a few songs, some jokes and me giggling so hard you could barely hear what I was trying to say. Yesterday, I got to relive my childhood 2011 style. Our 10-year-old has loved making up “shows” for as long as he could talk. He definitely seemed to be making up stories in his mind even before that. About a year ago, we purchase a computer just for our home schooling work and gave him free access to iMovie. I showed him how to find the tutorials on the Apple web site and let him go to work. I decided not to even try to teach him what I knew. I wanted him to teach himself. As his obsession with iMovie has grown, he came up with the idea to teach an iMovie class to his friends. I was completely in support, especially when I saw how much he was learning from planning the class. He had to decide what he would teach. He made a brochure to advertise it. He talked to his friends and their parents to recruit students. He planned out the whole day. He wrote a script for a movie. He wrote a speech to introduce the class. He made notecards. He practiced. He cooked muffins for the snack. He had his trial run of his four-hour class on Friday with five friends (plus his brother and sister). He really did a good job keeping the kids organized, explaining their parts, getting them to practice the movie and then teaching them iMovie. It was a long day and had it’s challenges, but it was a lot of fun. He is hoping he can teach more classes in the future. We only ran into a couple of snafus, but one turned out to be a huge blessing. I convinced him we should incorporate the “green screen,” which we had only used one time before to make a movie. 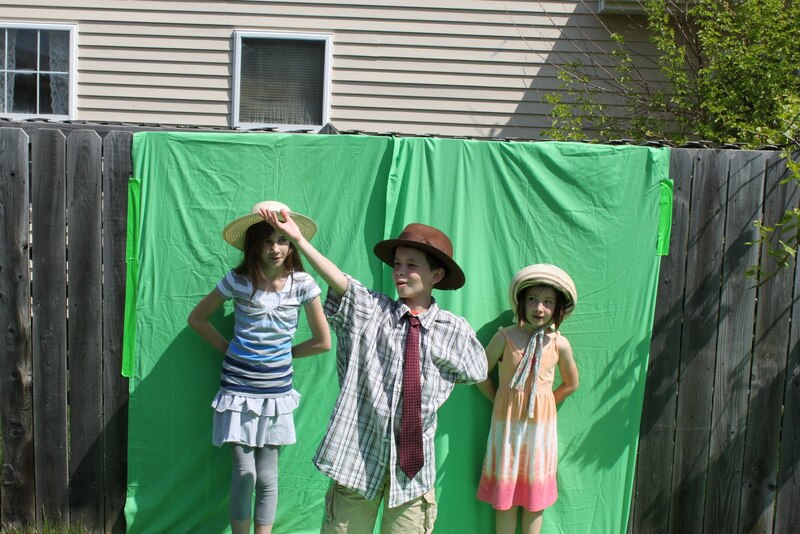 I didn’t take time to iron the big pieces of green fabric we use for our green screen, and that created some challenges in making the movie look good. Then, about five minutes into the editing segment, our iMovie crashed. 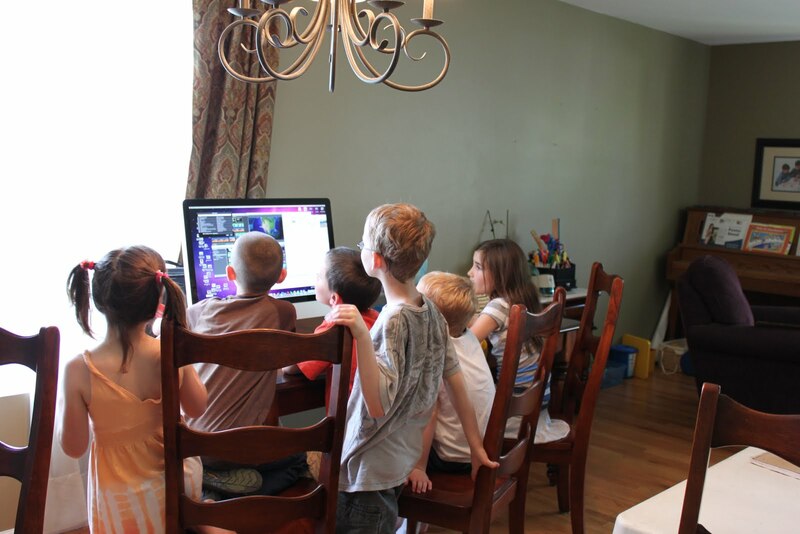 Fortunately, I had set up another work station with my computer for the kids to use, and I quickly started importing the video on the other computer to get everything working. While the kids were taking a break, I started frantically searching for the installation disk for iMovie that came with the computer. Little did I know that the computer I bought several months ago actually came with the installation disk for iMovie ’11, even though only version 10 was installed. In the midst of all of the chaos of making homemade mac ‘n cheese for nine children, helping my son keep everyone interested in the class rather than a game of freeze tag and trying to take care of the toddler, you should have seen me geeking out on the new version of iMovie. Not only does it have cool new “themes” for our movies, but it has a really slick and simple format to make movie trailers. After everyone left, my son and I spent the next few hours sitting next to each other at separate computers creating the movie trailers of our dreams. On one computer, he was living the life of a creative 10-year-old I couldn’t have imagined in my wildest dreams. On the other computer, I got to sit back and relax like I once did in front of my old cassette player — but this time 2011 style. And so, I leave you with the links to our movie trailer as well as his final production, which he did on his own. The trailer was a lot of fun to make. But it was even more fun to hang out with my son and learn something new together.